We introduced how to exploit the frozen pet bottle in "To enjoy the cool breeze in the mid summer(1)". And we'd like to intrduce you the way to enjoy the cool breeze in the kennel of mid summer in this corner. It is so simlpe way as same as frozen pet bottle. It sprinkle on the floor of the kennel by a hose. It useful to deter temperature increase of the kennel. And the kennel's floor dries at only several tens of minutes for example in the extremely hot day. So it useful cleaning effect. 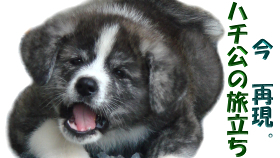 You can spray water on the Akita dog directly. But we don't recommend it. The reason why if the water enters into dog's ear vigorously by some chance, there is the risk that the Akita will be sick of otitis media. If the water enters into our ears, remove it by tilting our head with jumping. But dogs can't do it. If a dog is sick of otitis media, the ear emits a bad smell and can't get rid. So it is safe that we don't spray water on the Akita dog directly. If your Akita dog hopes to drink the water, you may give it when you sprinkle the water into the kennel by a hose. We recommend that you sprinkle the water as possible as on the floor without the height of dog's head. If you do it, the water doesn't into dog's water and they drink it looks delicious. We recommend you it is better not to give the cool by the method to a puppy. A puppy isn't to the point yet. There is a possibility to get water on the body and enter the nose in some cases. So we recommend you will do it after puppy's growth. There is a photo to give the water in the mid summer. The Akita dog are drinking the water.